Heat oven to 400°F. 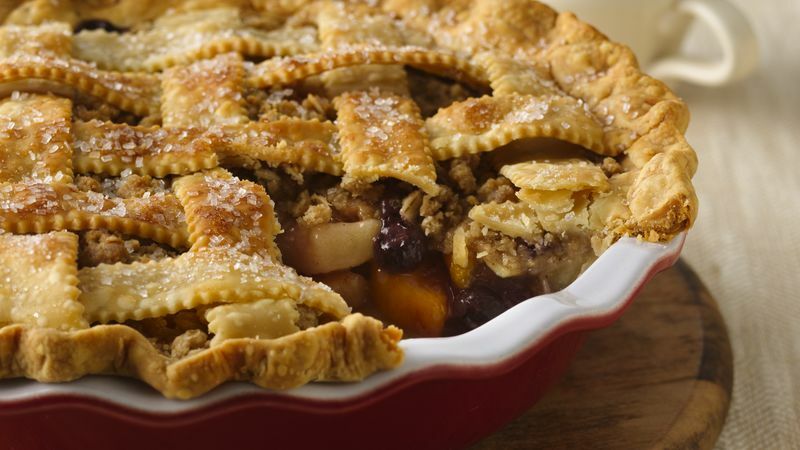 Make pie crusts as directed on box for Two-Crust Pie using 9-inch deep dish glass pie plate. In large bowl, place apples and peaches. Add lemon juice; toss to coat. In medium bowl, mix 3/4 cup granulated sugar, the pie filling enhancer, cornstarch, 1/2 teaspoon salt and 1/2 teaspoon cinnamon. Sprinkle over apples and peaches; toss to mix well. Gently stir in blueberries and vanilla. Spoon into crust-lined plate. In another medium bowl, place all crumb topping ingredients except milk and coarse sugar. With pastry blender, cut in butter until mixture looks like fine crumbs. Sprinkle topping on pie; press down lightly. To make lattice top, cut second crust into 1/2-inch-wide strips with pastry cutter. Place half of the strips across filling in pie plate. Weave remaining strips with first strips to form lattice. Trim ends of strips even with edge of bottom crust. Fold trimmed edge of bottom crust over ends of strips, forming a high stand-up rim. Seal and flute. Brush lattice strips with milk and sprinkle with coarse sugar. Cover crust with sheet of foil to prevent excessive browning; bake 30 minutes. Remove foil; reduce oven temperature to 350°F. Bake 35 to 40 minutes longer or until top is golden brown. Cool at least 2 hours before serving. Jennifer Klingler of Hamburg, Pennsylvania, won 1st Place with this recipe at the Pillsbury Refrigerated Pie Baking Championship, 2009 Allentown Fair (PA). For easy lattice top, place second half of strips crosswise across first strips instead of weaving. Trim end of strips. For an easy serving wow, drizzle dessert plate with blueberry pancake syrup before adding a slice of this mixed-fruit pie.